Reginald Asangba Taluah is the first child of three. Born on the 14th of April, 1984 in Tamale, he hails from Navrongo in the Upper East Region of Ghana. He had his secondary education at Notre Dame Minor Seminary in Navrongo, and received his B.A degree in English and Sociology in 2007. 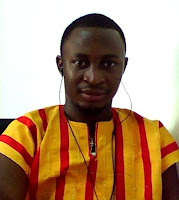 He is currently pursuing an M.Phil in Literature in English at the Department of English-Legon. 1. This poem evokes great curiosity in the readers. When you were writing it, how did you want readers to feel while reading it? My objective is to hold the reader’s attention, not just to the art but the message as well. I seemed to have loved the introductory stanzas I had earlier on recited that I consequently developed to its present state. Who is she? One may ask. And though I possibly will have my own idea or perhaps opinion about what is being referred to, the answer relies solely on the reader as he or she finds the landing site. 2. Was this poem inspired by any particular incident in your life? Influenced by particular other poems you have read? The inspiration is not only by an incident in my life but incidents in our lives. With the influences of other poems, I must say they are many. I see and hear many things around me and believe therein lies my concern and also my duty. I know for sure that I do not write the poem, the poem writes me. And that is the answer I often give when asked how I did it. I just can’t tell, and to be frank with you, I sometimes pose the same question to myself. 3. We seem to be profiling you about once a year, and each time checking in on the state of poetry on the campus at Legon. What is your update for 2009? If at all there is anything new, not to the best of my knowledge. "Open Air Theatre" on Radio Univers- Legon is still faring well. And I also want to believe Laban Hill’s poetry project will give birth to something great [ed. note: see the February 26th, 2009 posting on our News and Notices page for information on Laban Hill's new project]. The coming together of many budding poets is certain to yield fine results and perhaps I must say due to the demanding nature of my courses somethings may pass me by. 4. In your last interview you noted that "The assertions and praises rained on Ghanaians as being "peaceful" is also the driving force for Ghanaians not to tarnish the already good image they have attained." This certainly seems to have been proven true throughout the recent election process. What are your feelings on the election, and the prospects for Ghanaian peace and democracy in the future? At a point, some and probably most Ghanaians trampled on their patience. There was mounting tension in the country, but as the democratic threshold has been crossed without qualms, we give the glory to the Lord. I will always maintain that Ghanaians have gone a long way and will not mar their efforts. The knowledge that many eyes are watching from afar serves as an illuminating reminder. Ghana is equally securely girded with a tough belt of peace. Ghanaians also demonstrated a high sense of political maturity where constituency members sent self centered Members of Parliament packing. Those who neglected their roles as voices of their people and negotiators of developmental projects and rather concentrated in amassing wealth for their families and generations to come were kicked out. 5. Are you engaged in any writing projects (new poems, etc.) that you think our readers might be interested in? I guess I am done with a play manuscript and waiting to take the next steps. I seem to be unsettled at this point in time and though I keep writing new poems and editing, my academic work does not give me the liberty I need for a true organization. I am up to many things and you will not be left out at the appropriate time.